Culms to 2 times wider than thick, 35-60(-70) cm × 0.5-1.3 mm, hard, usually with to 10 blunt ribs, at 20X often finely ridged and minutely granular. Leaves: distal leaf sheaths brown to reddish. 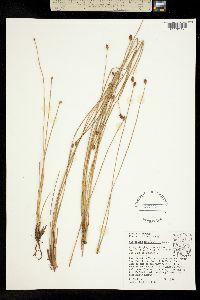 Spikelets 3-12 × 3-4 mm; proximal scale amplexicaulous, 3.5-4 mm, midrib region very broad and fleshy, apex entire; subproximal scale with a flower; floral scales 30-40, 8-10 per mm of rachilla, orange-brown to stramineous, midrib region stramineous, broadly ovate, papery or sometimes membranous, 3-4 × 2 mm, apex entire, rounded. Flowers: perianth bristles present, sometimes rudimentary, brown, length variable, obscurely retrorsely spinulose; anthers brown, 1.7-2.2 mm. Achenes subdeltoid in outline, sometimes broadly obpyriform, equilaterally trigonous, angles prominent, 0.9-1.2 × 0.7-1.1 mm, apex truncate. Tubercles sessile, depressed-pyramidal, often apiculate, as wide as achene, 0.3-0.5 × 0.7-1.1 mm. Fruiting summer. 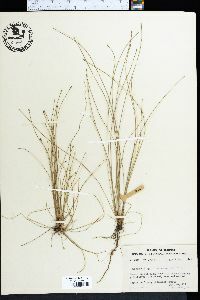 Fresh, oligotrophic, acid, sandy or peaty, often drying shores, ponds, ditches; 10-300 m; Ala., Fla., Ga., Ind., Mass., Mich., N.Y., N.C., R.I., S.C., Tex., Va. Eleocharis melanocarpa is reported from Rhode Island; I have not seen a voucher specimen. Perennial herb, densely tufted 20 cm - 0.6 m tall Leaves: reduced to bladeless sheaths, basal, two per culm, margins fused and enclosing culm, brown to reddish, with a truncate (cut straight across) apex that often bears a tiny tooth. Flowers: minute, spirally arranged on the axis of the spikelet, lacking sepals and petals, with bristles, subtended by a scale. Bristles brown, of variable length. Stamens exserted. Anthers brown, 1 - 2 mm long. Pistil one. Fruit: a one-seeded achene, dark brown, about 1 mm long and 1 mm wide, nearly triangular, sometimes reverse pear-shaped, with a flat apex, three-angled (angles prominent). Tubercle stalkless, to about 0.5 mm long and 1 mm wide, as wide as achene, depressed pyramidal with a pointed apex. Seed with a thin, non-adherent wall. Culm: unbranched, firm, wiry, 20 cm - 0.6 m long, to about 1 mm wide, compressed to two times as wide as thick, often up to ten-ribbed, often finely ridged and with tiny granules (at 20X), enclosed basally by two fused sheaths. Spikelets: solitary, 3 - 15 mm long, 3 - 4 mm wide, narrowly egg-shaped with a blunt apex, with 30 to 40 floral scales. Scales spirally arranged and overlapping, straw-colored to orangish brown with a straw-colored midrib, 3 - 4 mm long, to 2 mm wide, broadly egg-shaped with a rounded apex, papery, sometimes membranous. Habitat and ecology: A coastal-plain disjunct found in moist sandy prairies. It is most frequent in areas of wet sand that are characterized by other coastal-plain disjuncts. Has also been found growing on a floating muck mat. Etymology: Eleocharis comes from the Greek words heleios, meaning "dwelling in a marsh," and charis, meaning grace. Melanocarpa means "black fruit." Wet or moist, sandy borders of marshes and sloughs. Densely cespitose perennial; stems 2-6 dm, wiry, flattened, sometimes proliferous at the tip; sheaths truncate and prominently mucronulate; spikelet narrowly ovoid, 6-15 mm, obtuse, many-fld; scales firm, obtuse; bristles short or vestigial; anthers ca 1.3-2 mm; achene obpyramidal, trigonous with rounded angles, dark brown, 1 mm, truncate above; tubercle very flat, covering the summit of the achene and somewhat projecting at the margin, slightly elevated in the middle. Wet sand and pine- barrens, mostly near the coast; Mass. to Fla. and Tex., and inland in Mich. and Ind.